UPDATE: In April 2017 the City withdrew its petition. Check back on this page for information on the 2016 annexation petition by the City of Sand Point. We will update with more information as it becomes available. See the full, Local Boundary Commission (LBC) approved petition ﻿﻿here ﻿﻿(October 2016 version). April 15, 2016: The City submitted the draft petition to the LBC. The petition incorporated public comments and LBC staff input. October 4, 2016: LBC staff completed their technical review and accepts the petition for filing. Public comment period on the petition begins. December 7, 2016: Public comments and responsive briefs on petition are due. March 21, 2017: LBC staff completes preliminary report . April 18, 2017: City withdraws its petition from the LBC. 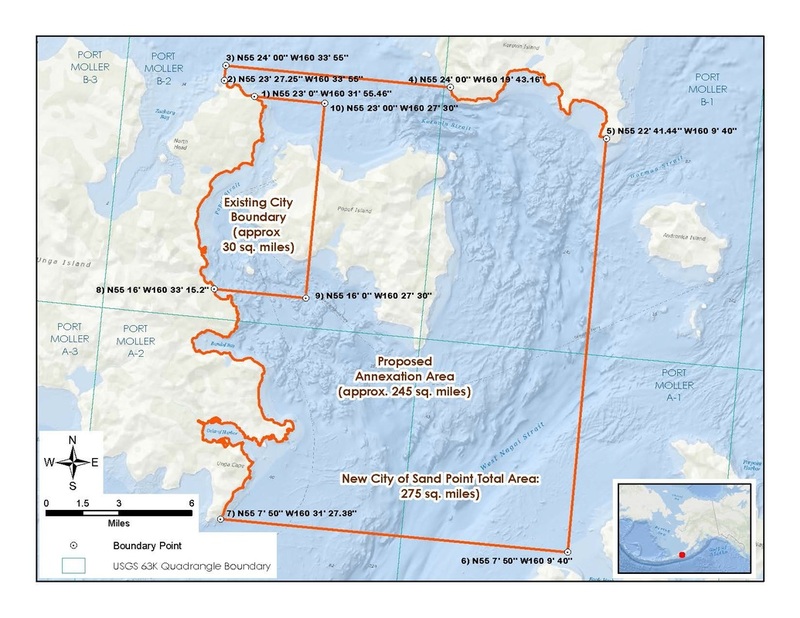 In order to annex, the City must file a petition with the Local Boundary Commission (LBC). If approved, the petition will undergo multiple public hearings and scrutiny during 2016. The Alaska Legislature will ultimately have to approve the petition during one of their scheduled sessions. The current City boundaries and proposed territory for annexation.